ALBANY, CA--(Marketwired - July 21, 2016) - Hopsy®, the only online marketplace and delivery service for fresh local craft beer, today announced the availability of the HomeTap™. Developed by KRUPS®, the company behind the Nespresso® coffee machine, the HomeTap is a sleek, stylish draft beer appliance that fits on the countertop. 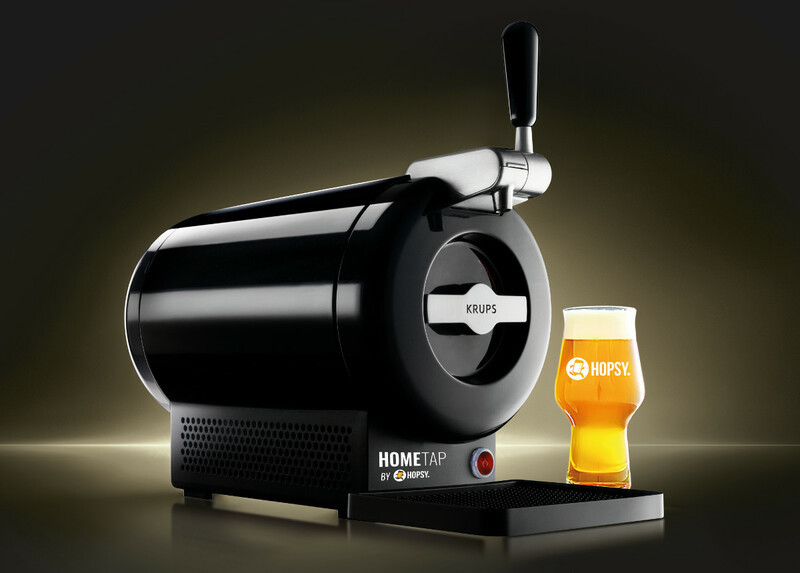 Available to Hopsy customers, the HomeTap is the only appliance on the market that allows customers to enjoy beer from Hopsy's craft brewery partners the way it is supposed to be enjoyed: draft, fresh and perfectly chilled. "The HomeTap is our latest innovation for the fast growing craft beer community," said Sebastien Tron, Hopsy's co-founder and CEO. "The HomeTap brings the ultimate taproom experience to any home by giving craft beer lovers the ability to serve their local favorites, as if it were a fresh pour at the brewery. With the HomeTap, we are basically bringing the best craft beer bars of the Bay Area directly to our customers." Beginning today, Bay Area residents in San Francisco, Oakland, Berkeley, Alameda and the surrounding area can order their very own HomeTap. Customers can order the HomeTap as a standalone appliance, as part of a Hopsy bundle, or in a monthly subscription called the HomeTap Beer Club. Customers that join the Hopsy HomeTap Beer Club, which starts at $59.99 per month, will receive a HomeTap, two filled HomeTap Bottles per month and a specialty craft beer Hopsy tasting glass. Weekly and bi-weekly delivery plans are also available. Customers will begin receiving deliveries around July 27. Each HomeTap Bottle contains two liters of beer, equivalent to roughly eight standard 8 oz glasses. The HomeTap keeps beer fresh on tap for up to two weeks after the HomeTap Bottle is tapped. Carrying on Hopsy's commitment to the best beer experience possible, the HomeTap also helps create an even bubble structure that brings out more flavor and aroma. "Hopsy has been an amazing distribution partner, and we are excited about this latest offering," said Dave McLean, founder of Magnolia Brewing in San Francisco. "Hopsy is the only company in the Bay Area that specializes in home delivery of fresh craft beer from a wide selection of local breweries, including ours. That commitment to freshness is vital to us, and now with the HomeTap customers can discover our beers with a fresh, draft experience right in their home." Hopsy has delivered over 100 different beers from over 15 different breweries, with more breweries coming soon. Beer enthusiasts living in the Bay Area are able to discover amazing breweries from the East Bay, San Francisco and as far as Sonoma and Half Moon Bay without having to leave their living room. Hopsy delivers in the afternoons and evenings, Thursday through Saturday, with new locations and services coming soon. Customers simply place their orders online for next-day delivery on Thursday, Friday or Saturday. Hopsy picks up fresh growlers and HomeTap Bottles from local breweries each week, so the craft beer is always fresh. Hopsy is the first local craft beer marketplace and fresh beer delivery service to connect local breweries with beer lovers. Hopsy's technology enables brewers to have their fresh draft beer delivered to local customers while providing consumers unprecedented access to local beer when and where they want. The company also has a mission to drive sustainability for local breweries by providing an alternative to the traditional distribution system. Based in Albany, California and backed by Ironfire Ventures and the Berkeley Angel Network, Hopsy will be expanding into new markets quickly. For more information, visit sf.hopsy.beer.